Getting enough of your healthy greens can be difficult at the best of times, but they play an important part of our overall health and well being by delivering vitamins, minerals, and antioxidants to the body. 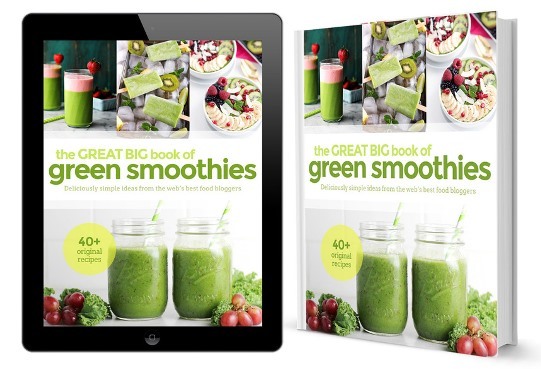 The Great Big Book Of Green Smoothies by Coterie Books contains over 40 mind-blowingly delicious recipes that will have even the most steadfast greens hater loving their greens. Leafy greens such as spinach contain high levels of heart-healthy antioxidants, iron, zinc, and vitamins B, C, & E. This book will show you how to take your humble leafy greens and transform them into health boosting smoothies that even the youngest of children will love. The book not only shows you the best flavor combinations, but also helps you understand how to begin to experiment with and love your greens. Inside you will discover 45 delicious recipes, easy to follow and understand instructions, stunning photos of the end results, a selection of smithies and deserts, and a nice selection of free gifts. The free gifts include a handy and easy to understand guide for making the perfect smoothie every time, plus a 30-day detox challenge chart. While the book is good for adults, it has also been written with children in mind. Today’s children live on a diet of sugar, fast food, and fat and getting them to eat anything even resembling leafy greens can seem impossible. The recipes inside will have your children eating their greens without even realizing it and help them get their daily dose of body-boosting vitamins and minerals. Everything you need to kickstart your leafy green smoothie lifestyle is included and will have you on the right track in no time at all. Learn to love your greens and take advantage of all the added health benefits mother nature provides to us in the form of those mighty little leaves of goodness.